I am a big fan of cheese. The rest of my family is not so crazy about it, and the fancier the cheese gets (in terms of odor, flavor, etc. ), the less excited other family members are. Goat cheese is one of them, that no-one else in this household would touch. Imagine my excitement when I realized that I can make my own goat cheese, have it all by myself and a good recipe to post on my blog. 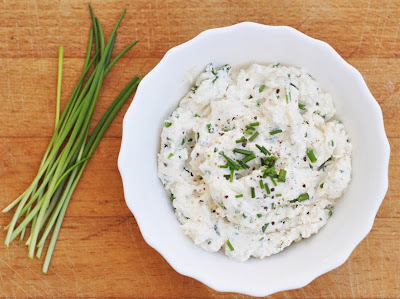 Goat cheese has this very special aroma that tastes really great with a few fresh herbs on a slice of fresh bread or simply crumbled over a salad, risotto or pasta dish. It takes a little time, but it is not exactly much work to make cheese. Bring milk to a boil, add some lemon, strain the whole thing in a cloth, hang it up somewhere, and that's basically it. A couple of hours later you have beautiful fresh cheese that you can season according to your taste buds and usage. Bring goat milk in a heavy bottomed pot to the boil over medium heat. Take off the heat. Immediately stir in the lemon juice into the milk. Leave standing for about a couple of minutes, so the milk can curdle. Pour the milk lemon mixture into the cheese cloth (or alternatively a clean kitchen cotton towel), that has been laid out in a bowl. Tie the ends of the cloth together so it becomes a bag. Hang it on a wooden spoon and let the bag hang free. The whey should be able to strain out of the cheese cloth for at least two hours. Before taking the cheese out of the cloth, you can squeeze the cloth itself to extract more liquid from the cheese. Transfer the cheese from the cloth to a bowl, season it with salt and pepper and fresh chives. Ready to serve.